Join the UWM community for a “chaotic” lecture presented by Dr. James A. Yorke, Distinguished University Professor of Mathematics and Physics at the Institute for Physical Sciences and Technology (IPST), University of Maryland. Scientists were probably the last people to find out about chaos. Everyone knows our lives are all chaotic: Predictable in the very short run and unpredictable in the long run. Chaos is an area of science and mathematics that describes situations in which small changes can cascade into larger and larger long-term effects. Meteorologist Edward Lorenz, one of the founders of chaos theory, suggested in 1972 that the flap of a butterfly’s wings in Brazil might set off a tornado in Texas, implying that we can never know all the factors that determine our weather. At best we can only predict the details of the weather a few days ahead. Chaos is a concept with many facets. It has several definitions that emphasize different aspects of chaos. No definition is complete. 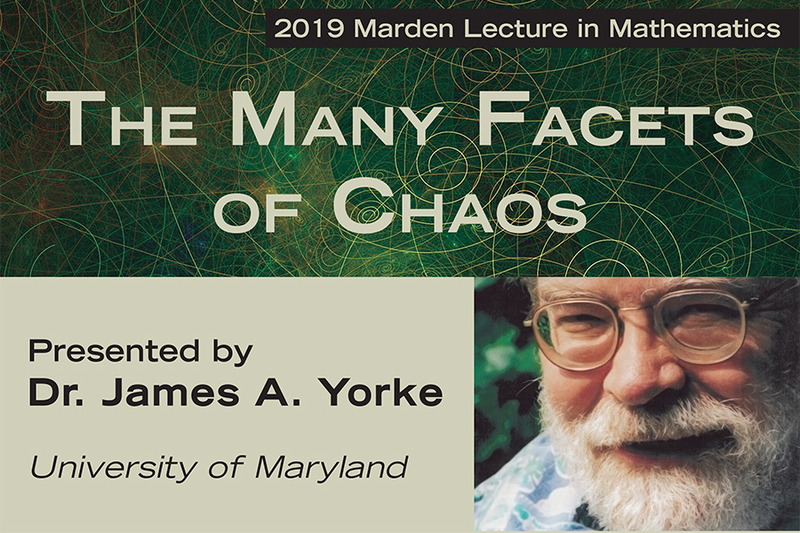 Dr. Yorke’s talk will illustrate how focusing on different aspects of chaos leads us in different directions and results in a fuller understanding of chaos.The Marden Lecture honors Morris Marden (1905 – 1991), who founded the UWM mathematics graduate program and made the Mathematical Sciences Department a research department. The annual lecture is supported by the generosity of the Miriam and Morris Marden Fund. Read more about Dr. Yorke at http://www.chaos.umd.edu/~yorke/. This event is free and open to the public. The talk takes place in Lubar Hall Room, N140.